West Virginia lawmakers have introduced a bill calling for a Bible course in all of the state's schools, continuing a decades-long debate about Bible teaching's place in the classroom. Senate Bill 252, sponsored by state Senators Mike Azinger (R) and Sue Cline (R), would mandate an elective course in both private and public schools that teaches "knowledge of biblical content, characters, poetry, and narratives that are prerequisites to understanding contemporary society and culture" while also adhering to "religion neutrality," according to reports this week. It has been sent to the Senate's education committee, with no slated debate date. The new legislation feeds off a changing political climate that has "emboldened" state lawmakers and public school officials "to inject religion into public schools" despite widespread reservations about constitutionality, Heather Weaver, a senior staff attorney with the ACLU Program on Freedom of Religion and Belief, told Newsweek on Wednesday. If West Virginia passed this legislation, it would join at least seven states, including Georgia, Arizona and Kentucky, which passed a bill in April enabling local school boards to create elective Bible literacy classes on Hebrew scriptures and the New Testament of the Bible as part of the social studies curriculum. Other states have taken a different approach. Florida passed a bill in June allowing students to organize prayer groups, religious clubs and other religious gatherings before, during and after the school day. Including religion as a topic of study and within class discourse isn't unconstitutional: The 1963 U.S. Supreme Court decision in Abington Township v. Schempp maintained that "the Bible is worthy of study for its literary and historic qualities ... when presented objectively as part of a secular program of education." Bible literacy courses have also received support from avenues such as The Republican Platform 2016, which encouraged state legislatures to offer the Bible "in a literature curriculum" as a high school elective, stating that, "A good understanding of the Bible being indispensable for the development of an educated citizenry." The real issue, Weaver said, is that Bible literacy courses can easily cross constitutional boundaries, especially for secondary education. "In many instances, the schools that want to teach the Bible are not doing so out of a desire to truly educate their students about the Bible,” said Weaver, adding that in her 14 years of work in this field, she’s rarely seen a Bible course that didn't—to some extent—proselytize religion. “It's more of a desire to promote Christianity and religious beliefs." Nonsecular implementation of Bible teaching has sometimes spurred legal action. In 2007, the ACLU, ACLU of Texas and two other entities filed a federal lawsuit on behalf of eight Odessa, Texas, parents who claimed the elective course "The Bible in History and Literature," then offered at two local high schools, espoused "a particular religious viewpoint that is not shared by Jews, Catholics, Orthodox Christians, and many Protestants," according to an ACLU report. The suit cited the Ector County Independent School District Board of Trustees and eight of its members and officials. 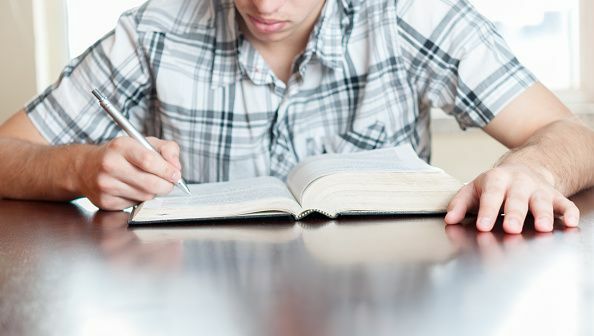 More recently, the ACLU of Kentucky also penned a letter to the Kentucky Department of Education this month expressing concern about the content disseminated during Bible courses. Following a public records request to the state's schools, the organization found that students in one county, for example, had to write to a family member encouraging them to visit the South Central Kentucky Cultural Center as a class assignment. Another county distributed a worksheet that asked students, "How are the virtues praised by the Book of Proverbs important character traits for society today?" Bills that might not "pass constitutional muster" are able to become law to begin with because lawmakers aren't tasked with determing the constitutionality of legislation, said Daniel Thatcher, education program director for the National Conference of State Legislatures. Challenges to a bill's constitutionality, he added, oftentimes come after the bill's passage in the form of litigation. Such litigation, he noted, invariably needs "a plaintiff who's been harmed by the legislation ... and it can be hard to find those people." Weaver said the ACLU's local affiliates plan to oppose the West Virginia bill, and are currently monitoring Kentucky's implementation of its Bible literacy bill. Kentucky's education department is in the process of developing curricular guidelines, she added. These developments are “definitely something we're keeping our eye on,” she said.